You may feel like you’re experiencing a bit of deja vu seeing that photo. Yes, you saw it when I talked about the quick bread frosting I made with the new Kerrygold Premium Spreadable Butter. You even got the recipe for the frosting. But I didn’t really talk about what was under the frosting. And that must be addressed. Back in October I was introduced to this pumpkin bread by my friend Mary. She stopped by for a visit and brought along a wee loaf of it for me to enjoy. Now let me say that a visit from friends is an absolute pleasure. But when they also come bearing gifts lovingly made with their own hands….multiply that by infinity. After only one bite I was badgering Mary for her recipe. And she told me that she had found it on allrecipes.com. A few google moments later, I pulled the recipe up on my phone and had her confirm that I found the right one before I could continue in any kind of normal conversation. A few weeks later, I went about making the pumpkin bread not knowing the chain of events that it was about to start. First, I used it as the delivery vehicle for the quick bread frosting as part of the Kerrygold competition. Then, I took some to work for a birthday celebration….congratulations, you’re a year older, please have a slice of quick bread. I also delivered a loaf to the folks at the coffee shop who get my morning caffeination needs met Monday through Friday and to my chiropractor and his staff for taking such good care of me after the latest fender bender. Lastly, I sent the rest of the batch off to the Headquarters staff of my sorority to thank them for all of their support in the last few months. Yes, I was using butter, sugar, and pumpkin to express my thanks and appreciation. Or in the case of the competition, to share my #butterlove…it’s what I do. And I do it for the joy that I receive from the act of expressing my gratitude or sharing my love of something with others. It’s as simple as that. But sometimes, that gratitude has a way of being returned to me. Take the Headquarters staff. They had no idea that a lovebomb was coming their way. When it arrived, it made them feel special. And it could have ended there with their enjoyment of the pumpkin bread and cookies. But they took a moment to sit down and write me a note to tell me how much they enjoyed the treats and to thank me for thinking of them. It made my heart smile. And then, most unexpectedly, my chiropractor asked me whether I sell any of the things I bake because he had 16 guests coming for Thanksgiving and wanted to include the pumpkin bread in their holiday meal. If I hadn’t been so relaxed and dreamy from the adjusting he was doing, I would have probably laughed because it has never been my ambition to do the cooking and baking as my profession. On the contrary, I do it as a bit of personal therapy. So I told him that what I don’t keep for our personal enjoyment I give away. And then I asked whether I could give him a batch of pumpkin bread for his Thanksgiving. Because really, is there a bigger honor than being asked to share something I have made with someone’s family for Thanksgiving? In that moment, I felt the Universe beaming my gratitude back to me. I can’t promise you that this pumpkin bread will bring you fame or fortune. But it just might bring you a bit of gratitude when it’s least expected. BAH Note: Go ahead and bake up two batches like I did…the quantities below make a single batch. Because according to Mary, the loaves freeze beautifully. So even if you plan on giving most of it away, stash a well wrapped loaf or two in your freezer for your own enjoyment. You will likely need to mix each batch separately, unless you’ve got a ginormous mixing bowl. And be sure that you’re using canned pumpkin puree, not pumpkin pie filling. Heat oven to 350 degrees. Butter and flour six 3×5 disposable aluminum loaf pans and set them on a baking sheet. In a large bowl, whisk together the pumpkin puree, eggs, oil, water, and sugar until combined. In a separate bowl, using a clean whisk or a fork, whisk together the flour, baking soda, salt, and spices. Stir the flour mixture into the pumpkin mixture until they are just combined. Pour the batter into the loaf pans and bake for 40 to 50 minutes, rotating your pan halfway through the cooking time, until a tester inserted in the center comes out clean. Transfer the loaves to a rack to cool completely before wrapping in several layers of plastic wrap for freezer storage. 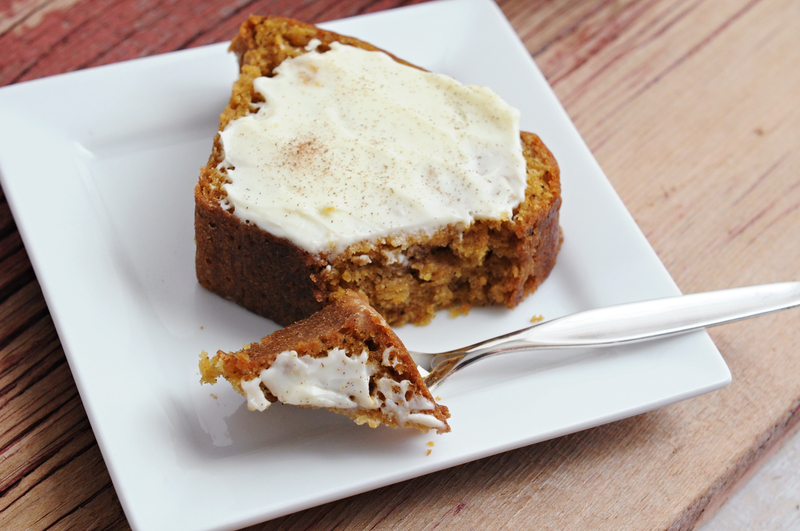 Pumpkin bread, gratitude, #butterlove… What else do you need? Beautiful post and I think I will be making this bread very soon with that can of pumpkin I bought last month and mysteriously never got around to using. Thanks friend.� I think that can of pumpkin puree needs to fulfill it’s destiny and become some of this delicious quick bread. Can you give me an egg substitute for this recipe? It looks delicious! When you have the time, do drop by my space. I’d love to hear from you. That’s a great question. Unfortunately, I’m not very wise in the ways of substituting eggs. I googled to see if there were any tried and true replacements and there seem to be some alternatives that you could investigate. Since I’ve never personally worked with egg substitutions, I can’t endorse any of them. Wow–you have one lucky chiropractor! Jenna, that man has taken away so much physical pain that he deserved that pumpkin bread and then some. Yeah, finally something that you can enjoy without having to figure out substitutions. Jen, you NEED to make this quick bread.� It’s simply wonderful. I’m with Jenna–your chiropractor is a lucky devil! I’ve learned that it is good to take care of the people who take care of me. I consider it the culinary equivalent of tipping the bartender.